We had a call this week from one of our customers in Bellaire with a curious question about a strange Christmas tree ornament like cocoon sh e was finding around the outside of her home. Perhaps you have seen these around your own Houston home and did not know what they were. 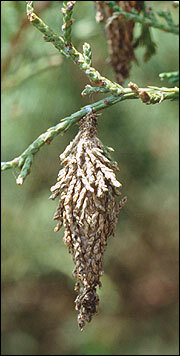 The bagworm moth is very common in our area of Southeast Texas. This is the picture of the cocoon that houses the caterpillar until it hatches. Bagworms, once hatched, can cause serious damage to trees and shrubs because they use tree foliage and bark to feed as well as maintain their webs. 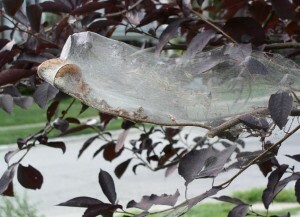 The webbing created from hatched worm s is seen frequently in trees around Houston. Many people commonly confuse bagworms with webs created by spiders. The best way to treat for bagworms is to remove the webbing and live worms from the tree or shrub they inhabit. However, some topical pesticides can help eliminate bagworms and prevent bagworms from developing in trees that are particularly prone to infestation like cedar, evergreens like the southern live oak, as well as pine trees. So tell us Houston...what other sort of mystery pests are lurking around your home? Tune into our Facebook or Tweet us a pic of your creepy crawlers. We'll be happy to investigate and give you tips on how to control any Gulf Coast pest in or around your home. Posted in Uncategorized on June 19, 2015 by Bulls Eye Pest and Termite Control.